One of AOL's top executives has left the internet firm soon after a privacy breach in which the search queries of 650,000 subscribers were released. AOL apologised for accidentally giving details of 20 million search queries by US customers earlier this month, admitting the breach was a "screw-up". Although the queries were anonymous, there were fears the search details may contain personally identifiable data. Chief technology officer (CTO) Maureen Govern has now left the company. According to Reuters - which cited a company memo announcing the changes - she has been replaced by former CTO John McKinley. AOL has not commented on the issue. Ms Govern oversaw the division responsible for inadvertently releasing the search data, published on its research site. 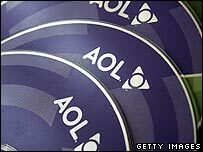 AOL, owned by media giant Time Warner, removed the offending file but not before copies had begun to circulate on the internet. At the time, AOL said it was "angry" and "upset" about the breach. The error prompted several complaints to the Federal Trade Commission by privacy advocacy groups calling for an investigation. According to Reuters and Associated Press, AOL is setting up a task force to examine its data collection and retention policies. "We have to earn their trust each and every day and with each and every action we take," Reuters cited a memo from chief executive Jonathan Miller as saying.